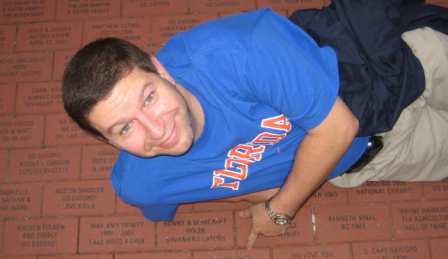 My name is Jarrett, I live on Long Island (New York), and I am a passionate Gator fan. What has led me to embark on such a quest? 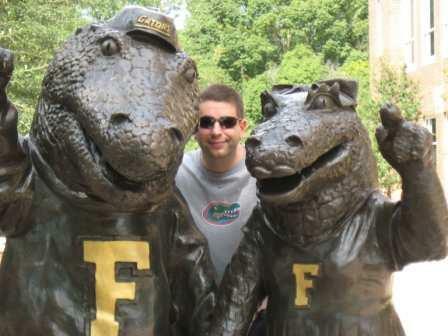 The answer to that dates back to the decision that I made to attend the University of Florida. I was born and raised on Long Island. Growing up in the Northeast, I was a huge sports fan. Hockey and football were my favorites. But because the Northeast and particularly downstate New York, is not known for college football, I did not gain an appreciation for the differences between pro football and college football. I watched both, but I believed the differences were confined to a few rule differences and college football was played on Saturday while pro football was played on Sunday. Both provided a way to occupy a fall/winter weekend, but other than the day of the week there was no key difference. Boy was I misguided to say the least! When the time came to go to college, I chose to attend the University of Florida (to my mother’s dismay as she wanted me to go to Washington University in St. Louis). Going to college in Gainesville allowed me to experience that while pro football is a game, college football is an event. My timing could not have been any better as I arrived at the University of Florida in the fall of 1990 which coincided with Steve Spurrier’s arrival from Duke. During my years at UF, I learned to love the pageantry that is college football; including neutral sites games against Georgia in Jacksonville, SEC Championship games (which back then seemed to be the Florida Gator invitational), and even the occasional road game. To see a college football game in all Division I-A stadiums. It is my goal that through this quest I get to experience the greatness and pageantry that is college football all across this great nation. I am a firm believer that at the end of the journey of life, it is the experiences we have had that will remain with us and not the things we have accumulated. Further, through this quest I am going to get to travel all over the country and see a lot of the great colleges, cities and towns in America. It is also my hope that as my children get older, we can share these trips as a family and create some very special memories. This will particularly be the case when these trips take me to some of the places that my wife would really like to go, like California and Hawaii. I have other hobbies and interests but they have become background to this quest. I would like to learn to fly (the pilot type, not the superhero type). It would be nice to be able to rent a plane and fly directly into some of the smaller out of the way schools. But my wife has said no more expensive hobbies, and I cannot exactly blame her, so that will have to wait until I win the lottery or something. A special mention must be made that this quest would not be possible without the support of my wife and two children. My wife jokingly (I hope) thought this site should be called questfordivorce.com. We will see if she shares that opinion when she wants to accompany me on the trip to see the University of Hawaii or any of the California schools. I fear I will be all alone at places such as Moscow, ID or Mount Pleasant, MI (my apologies to residents at those schools, but you cannot escape the fact that you live where it gets very cold) but have plenty of company elsewhere. Again, I thank my wife and kids for allowing me the 4 trips or so a year that will help me accomplish this quest.